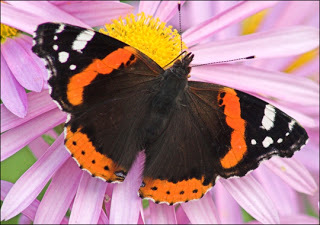 Two Red Admiral butterflies have been visiting us on our balcony over the last few days. They’ve brought much joy and pleasure to Zan and myself as we’ve quietly observed their paradoxical fragility and beauty. Washing this evening’s dinner dishes I chanced to look out the kitchen window, only to see one struggling in an almost invisible spiders web on the side of the balcony. The poor wee thing was flapping for all it’s worth trying to free itself, but all to no avail. Immediately I ran out and pulled my new, little friend free from its web trap, yet some of the sticky strands remained attached and it still couldn’t yet fly properly. Letting me hold it in the cup of my hand I broke the remaining adhesive web thread and off it flew, fluttering high above our home into the English evening sky. Reminds me of the way Divine Love reached down and freed me from my religious codependency chains all those years ago. I couldn’t have managed it on my own. I’m with you on that one. Sometimes ego blocks out the view and spins its tale of a fearful tyrant, but yes, Divine Love is the Source of goodness itself.